With the announcement that the Norwegian duo of Espen Sandberg and Joachim Roenning are set to helm the next ‘Pirates of the Caribbean’ movie, there will be a lot of scrutiny on their current body of work in years to come and a lot of doubt about the continuation of a series that has been gradually more derided as it has progressed, with many hoping that they can re-inject something in to the franchise. The double act have done good things in the past, with ‘Max Manus: Man of War’ being a strong, suspenseful thriller and this film having been nominated for an Academy Award all the way back in 2012. Delayed releases mean that it’s appearance in UK cinemas has happened a whole two years later, but it’s still evident to see why it was so well received and continues to be now. 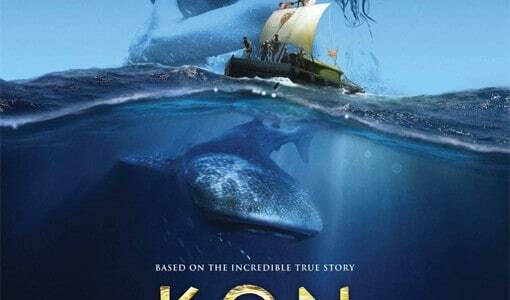 Chronicling the famous Kon-Tiki journey of 1947 where Norwegian explorer Thor Heyerdahl sought to show that Polynesia was populated from the east rather than the west as was uniformly thought at the time by travelling from Peru across to Polynesia on a raft, thus showing that it is possible to get across the sea purely by allowing the current to take you along. With a plot as intriguing as that it was up to the directors to ensure that they deliver a tense, intelligent and engaging film that elevates above standard survival cliches, and that’s exactly what they manage. Aided by strong performance by its strong cast and in particular a great turn by Pål Valheim Hagen as Heyerdahl, it manages to be gripping throughout and tells its spectacular tale in a way that makes sure it isn’t overblown while also taking care to portray the wonders that the raft inevitably comes across. Sporting a budget of $15.5 million, the biggest in Scandinavian film history, it is also visually stunning, shot beautifully and featuring wonders such as whales and sharks that are spectacular in the clear blue water of the Pacific. This size and scope was completely necessary in creating that feeling of isolation, and ensures the film is as epic as it needs to be. Where it is perhaps is at its weakest is in the human interactions, which can at times be a little heavy-handed, interactions on the raft are sometimes needlessly portentous and arguments that are intended to increase the tension are instead just mundane compared to the grandeur before us, but the fact that the film never overstays its welcome is an achievement when we’re on a raft for the vast majority of the film. It’s an achievement that bodes well for the duo’s future work, and maybe there is hope for that ‘Pirates’ film yet.